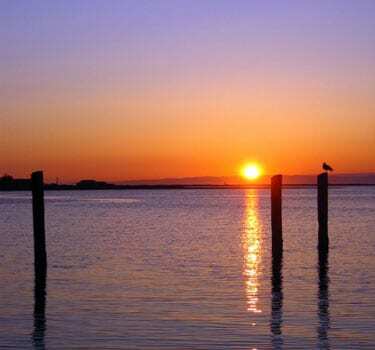 We are located right on the beach in Sequim Washington. Our views of the Strait of Juan de Fuca and Olympic Mountain Range will captivate you. Our guests explore Olympic National Park the Sequim Lavender fields and Dungeness Wildlife Refuge. 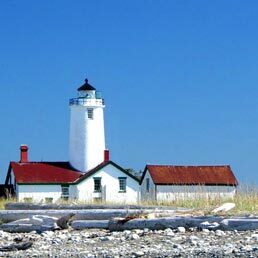 Make your memories in Sequim at Dungeness Bay Cottages. Welcome to Sequim and Dungeness Bay! We offer six comfortable and well appointed units with full kitchens. Each unit overlooks Dungeness Bay and your own private beach. As written by Olympic Best Places, “…the muted song of the surf [will] lull you to sleep.” Dungeness Bay Cottages is our new name! You’ll find the same great place, views, and owners; just with a more descriptive name. Tripadvisor has reviews from previous guests, so go check it out! Frommer’s Seattle & the Olympic Peninsula For Dummies boast that you’ll be staying in style: With “a collection of roomy cottages, Dungeness Bay Cottages enjoys a lovely setting…with private beach…picnic tables & chairs. The cottages have full kitchens…plus sweeping views of mountains & cow pastures outback!” Two of the units can accommodate up to four people with the sofa bed in the living room providing a second bed. All units have Wireless Internet access. Fantastic! What a week… Seals playing almost on our doorstep, sea kayaking to the lighthouse, playing in the surf and hiking the Dungeness Spit. With the Wildlife Refuge in front of us, and acres of pasture land behind us, we provide a very quiet setting in the sunny “rainshadow” of the rugged Olympic Mountains. From our landing, lawn, or your living room, you can experience spectacular sunsets and panoramic views of our bay, the Dungeness Spit, the Strait of Juan de Fuca, British Columbia, the San Juan Islands, and beyond! Take advantage of our southern exposure and enjoy a picnic or barbecue with the Olympic mountains as your backdrop. For the adventurous gourmet, we invite you to share the bounty of our region. Local seafood, shellfish and Dungeness crab, as well as fresh local produce and products from our local growers and farmer’s markets can be enjoyed at our local cafes. Don’t forget your binoculars, or your favorite book. We recommend A Natural History Guide, Olympic National Park, by Tim McNulty, a local author. *Dungeness Bay Cottages is a smoke free property and we’ll be happy to recommend local boarding for your pet! * Our property will not accommodate multiple vehicles, boats or trailers! *WE WERE FULL FOR THE 2018 LAVENDER FESTIVAL IN JULY! * Book now for 2019! Tour de Lavender is very popular with our cyclists! CLICK THE RED BOX AT TOP OF THE PAGE TO BOOK! THE VERY POPULAR RED WINE AND CHOCOLATE TOUR Two weekends to taste our local wines paired with fabulous chocolates in February! Red Wine and Chocolate Weekends! Nash’s farm store: Your very local grocery, just about everything you could want, beer, wine, snacks as well as local, organic meats and produce! Just minutes from us @ 4681 Sequim-Dungeness Way near the historic Dungeness School House. Bird Walks: Every Wednesday morning, 8:30 a.m. to 10:30 a.m.
Meet at the River Center for a leisurely walk to see and hear the birds of the lower Dungeness riparian forest. Farmers Market: Downtown every Sat. in the summertime, near Jose’s Salsa restaurant and our very walkable downtown galleries and shops. April is BIRDFEST month, see below! April is your chance to make a connection with nature at the Olympic Peninsula Bird Festival – on quiet bays, estuaries, beaches on the Strait of Juan de Fuca, an island bird sanctuary, the 5 mile long Dungeness Spit, and the beautiful Dungeness River Valley. Experience guided birding trips, boat tours, kayaking, salmon banquet, and many other presentations. The festival has a full slate of extraordinary offerings waiting for you. Grab your binoculars and enjoy the grandeur of nature’s presence. Every year in April, join us for the Audubon Olympic Birdfest; a 3 day & 2 night Bird Cruise follows Birdfest each April. Book your stay now! LAVENDER FESTIVAL: Book now for 2019! DUNGENESS RIVER FESTIVAL Every Sept., Activities for kids and adults, music, art, food, and much more. THE DUNGENESS CRAB & SEAFOOD FESTIVAL: Make plans now for October!